Business Driven Creativity simply means every thing we do, we do for one reason; it’s impact on our clients’ bottom line. We don’t design websites to win awards (though we’ve won plenty) we design websites to increase our customers profits. We won’t come up with some crazy idea for a post card design or brochure unless the extra money spent is going to increase the ROI. 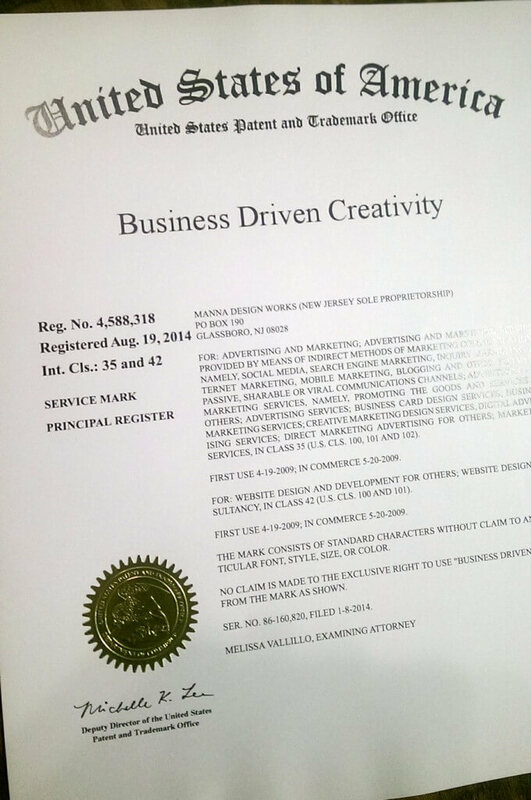 It only took 2 hours to apply and 8 months of waiting, but it’s official… Business Driven Creativity is officially a registered service mark of Manna Design. We use this term as our guiding philosophy in nearly everything we do, so it’s nice to officially ‘own’ it. Learn more about it here or click on the image below. The official copy of our new trademark “Business Driven Creativity”. Representing our guiding philosophy in web design, graphic design and marketing. The mark consists of standard characters without claim to any particular font style, size, or color.